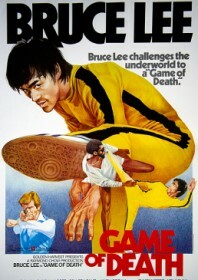 Lee’s unfinished Game of Death would prove to be one of his most successful films despite its shameful exploitative nature. Scrapping Lee’s original concept, Enter the Dragon director Robert Clouse was brought in to recreate a new posthumous Bruce Lee movie using footage Lee had already filmed prior to his death. The result is a mostly pedestrian Hollywood melodrama, horribly cobbled together and completed almost entirely with the help of body doubles and lookalikes (Kim Tai-chong and Yuen Biao among them), and featuring less than subtle snippets from Bruce Lee’s other films. This comedy of errors is matched by an equally souped up storyline in which ‘Bruce Lee’ plays screen icon Billy Lo, targeted by a criminal syndicate who are eager for the actor to join their organisation (led by Americans Jagger and O’Brian). Billy is shot on the set of Fist of Fury but survives, only to stage his own funeral and attack his adversaries in disguise. As an additional insult, footage from Bruce Lee’s real funeral are used during these ceremonial scenes. In stark contrast to everything prior, the final scenes are poetry in motion. The real Bruce Lee, wearing an iconic yellow jump suit, storms through levels of a pagoda to confront three formidable opponents in quick succession: Dan Inosanto in a riproaring nunchaku battle, Hapkido expert and screen stiff Ji Han-jae in a hand to hand grapple to the death, and 7’2” basketball star Kareem Abdul-Jabbar in a legendary David and Goliath encounter. Nothing beats the excitement generated by Bruce Lee in these closing scenes. The rest of the film is simply ugly. Note: the Cantonese version features less chat and more action, including Kim Tai-chong’s greenhouse duel with Casanova Wong, later featuring in the bizarre fun of Game of Death II.